Have you ever seen ants walking in a line and wondered how they do it? Scientists have known for a long time that ants use secreted chemicals called pheromones to communicate complicated social signals including which trails to walk on. While we knew that ants fluently speak pheromone, we didn’t know what specific genes and receptors they use to perceive those pheromones. A new paper from researchers at Rockefeller University has uncovered the genetic basis of pheromone detection. They did that by creating genetically modified ants. They learned that it’s all about smell, and a class of proteins called odorant receptors. These researchers had two goals in mind. The first was to figure out what receptors the ants were using to perceive pheromones. The second was to see just how weird ants would be without them. Ants have about 350 genes in the odorant receptor family, which is many more than other types of insects like flies or bees. Because they have so many more receptors and because pheromones play a huge role in the life of an ant, the researchers thought that odorant receptors may be involved in pheromone perception. But how can you test whether odorant receptors are required to perceive pheromones? If you had to individually shut down all 350 of those receptors to find out, it would take a lifetime! Luckily there is one protein that all odorant receptors and only odorant receptors need to function. That protein is called orco and it is the protein that these researchers mutated in order to make their ants. Ants without orco lack all odorant receptor function, allowing these researchers to use orco mutants to study the role of odorant receptors in pheromone perception. While making an ant lacking orco may sound easy, it is definitely easier said than done. For many ant species creating a mutant is practically impossible to do. These researchers got around that problem by using a special ant species called the clonal raider ant. They’re called clonal because they make exact duplicates, or clones, of themselves to keep up the population. This clonal colony structure means getting a mutant ant is much faster than with ants that have a sexual reproductive system. 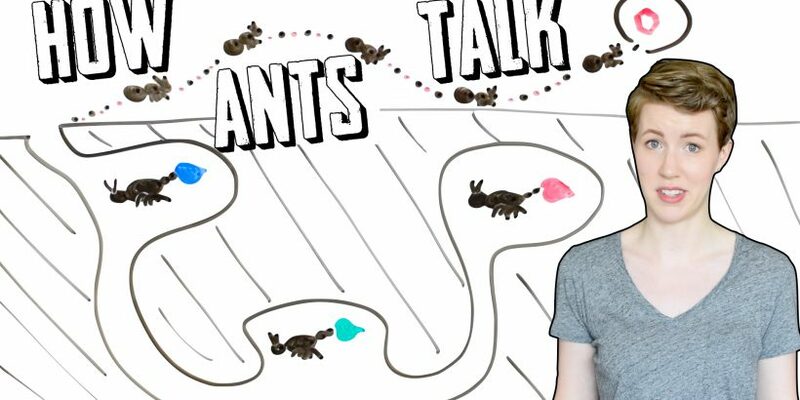 Alright, now we know which ants they used and what gene they mutated, so let’s get to the question I’m sure you’re all wondering. How weird were these ants? Well, the answer is that they were about as anti-social as your average teenager and just about as restless. Ants with orco mutations tended to march to the beat of their own drum. They didn’t nest down with the rest of the ants and instead frequently got up to wander around. They also didn’t follow the trails laid by other ants and they didn’t seem to mind the smell of sharpie markers, which strongly repels normal ants. In addition to these obvious changes in behavior, the ants also showed big changes in their brains. In fact, orco mutant ants have smaller brains and have less odor-specific neurons in their antennae! orco mutant ants had 82% less antennal lobe glomeruli, which are the specific odor processing units in the insect brain. An 82% decrease is like going from a regular sized bag of M&Ms down to fun-sized. These findings are just the start of a whole new area of research. Now that scientists are able to make ants with genetic mutations, they can make all kinds of weird ants to figure out even more about their life underground. They can also use the orco mutants they have right now to study how pheromones are processed in the ant brain. This video and article was made for Cell covering W. Trible et al. “orco Mutagenesis Causes Loss of Antennal Lobe Glomeruli and Impaired Social Behavior in Ants” Cell (2017). Plant Defense and Disease Resistance! Why Haven't We Cured HIV yet?